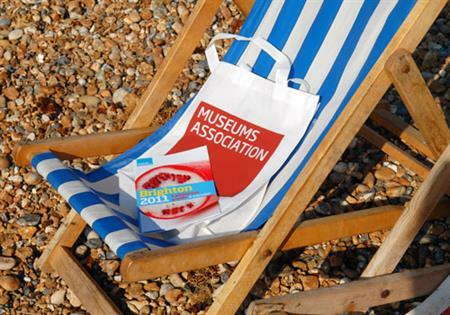 Despite an issue with the venue, Brighton proved a successful setting for the Museums Association's Annual Conference. The Museums Association Annual Conference and Exhibition is the biggest conference in Europe for people who work in museums and galleries. It is a forum for exploring issues within the sector, policy initiatives and best practice. Sharon Heal, head of publications and events at the Museums Association, organises it. "We plan where it will take place years in advance. The location is subject to board approval but we try to rotate around the country. We consider the cultural organisations in the host cities, the museums and galleries that can host evening receptions and the capacity of the conference venue," she says. In October 2011 the event took place in Brighton, 100 years after it last went there. It was anticipated that the facade of the main venue, The Brighton Centre, and signage inside the building would be revamped in time for the conference. However, owing to delays in the building schedule, delegates arrived to find it behind scaffolding. There was little Heal could do to rectify the issues regarding the building, but the association had its own stewards on site to help delegates find their way around. She was also able to negotiate a small discount. Four keynote speakers presented over the two days, including Ed Vaizey, minister for culture, communications and creative industries, and Tim Smit, chief executive and co-founder of the Eden Project in Cornwall. "As well as the keynotes there were five concurrent sessions and delegates could follow a theme or pick and mix," Heal explains. "Sessions varied, from 45-minute round-table debates to traditional plenary sessions. We also held our AGM." The association has increased its social media presence, with pre-conference hashtags and tweets to build interest. Heal and her team also blog, publish online news from the conference sessions and have live twitter feeds during the main sessions. A networking event was hosted by digital publisher Culture 24 at arts venue The Lighthouse on the first night, and a reception was held at the Brighton Museum and Art Gallery and Brighton Pavilion. The conference also featured training sessions for the first time, in line with the association's professional development scheme. The bite-size sessions had limited places but proved very popular so will be rolled out again this year. Heal thinks Brighton worked well and was delighted that delegate numbers were consistent with previous years and that the event attracted 80 exhibitors. "We use social media to measure how many people are tweeting about the event, but we do formal evaluations as well, with email surveys asking for views on the themes, the programme and the look and feel of the event," says Heal. "We've had really positive feedback about the programme. The only negative comments were about how difficult it was to navigate the venue." The conference will take place in Edinburgh in November 2012 and Liverpool in 2013. 2 October 2011: Build begins.